string(1235) "Resource Centre > Uncategorized > Strengthening Protection Against Trafficking in Persons in Federal and Corporate Supply Chains"
Verité has collected comprehensive data about global industries with a significant history or current evidence of human trafficking or trafficking-related activity, and has analysed the over-lap between global supply chains deemed to be at risk for human trafficking and patterns of United States federal procurement. The results of Verité’s research are presented in the Report. 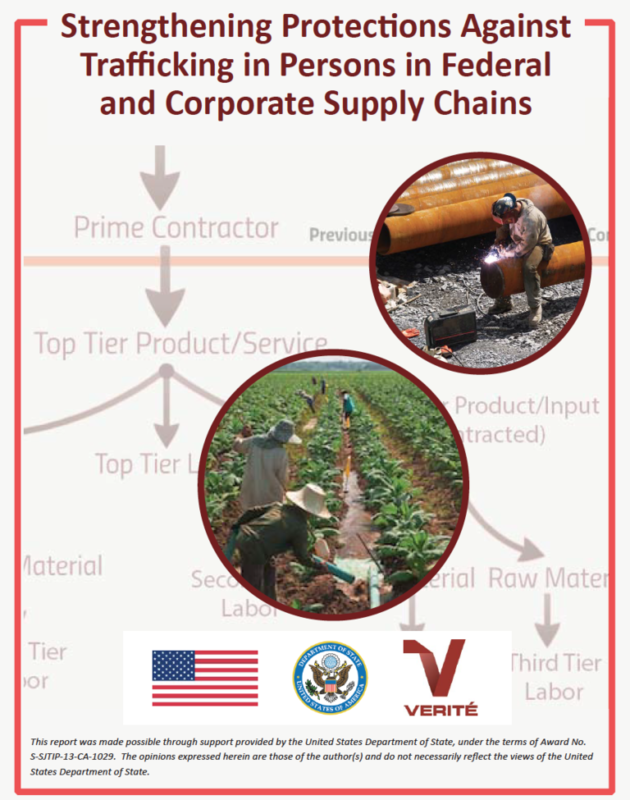 The report is not intended to provide specific guidance on U.S. President Executive Order Strengthening Protections Against Trafficking in Persons in Federal Contracts compliance, but it does provide the framework and resources necessary to understand the risk of human trafficking in global supply chains, and can help readers begin to assess the risk of human trafficking in particular federal supply chains.